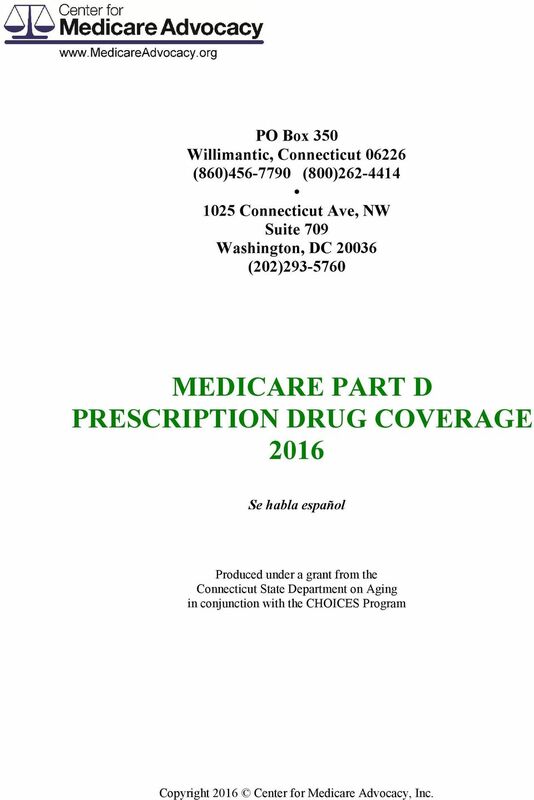 Download "MEDICARE PART D PRESCRIPTION DRUG COVERAGE 2016"
1 PO Box 350 Willimantic, Connecticut (860) (800) Connecticut Ave, NW Suite 709 Washington, DC (202) MEDICARE PART D PRESCRIPTION DRUG COVERAGE 2016 Se habla español Produced under a grant from the Connecticut State Department on Aging in conjunction with the CHOICES Program Copyright 2016 Center for Medicare Advocacy, Inc.
2 MEDICARE PART D Medicare pays for outpatient prescription drugs under a program called Medicare Part D. Medicare does not provide coverage directly. Instead, coverage is provided by private companies that sell Part D insurance. There are many different Part D plans to choose from and they differ in the drugs they will cover (formularies) and costs (premiums, deductibles and co-pays). 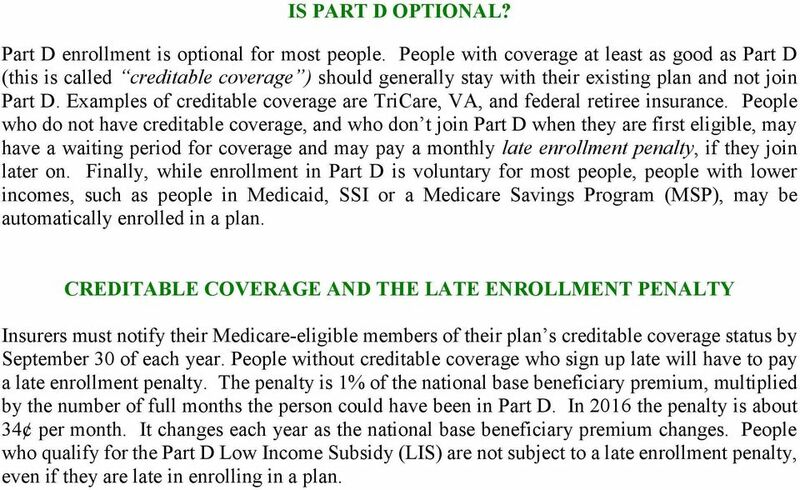 WHO S ELIGIBLE FOR PART D COVERAGE? 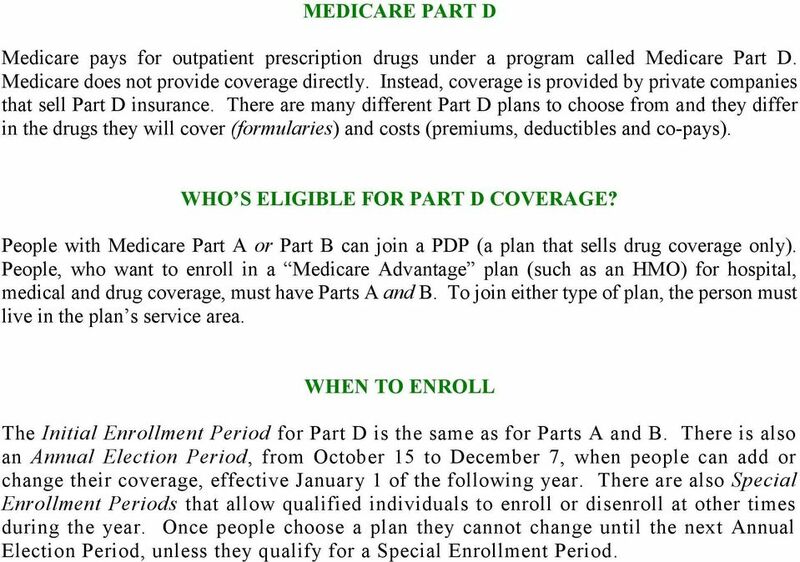 People with Medicare Part A or Part B can join a PDP (a plan that sells drug coverage only). People, who want to enroll in a Medicare Advantage plan (such as an HMO) for hospital, medical and drug coverage, must have Parts A and B. To join either type of plan, the person must live in the plan s service area. 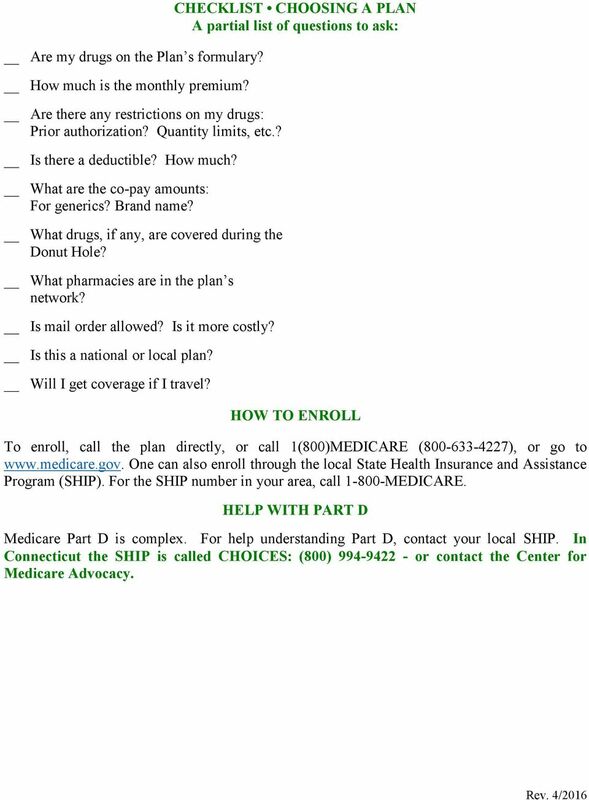 WHEN TO ENROLL The Initial Enrollment Period for Part D is the same as for Parts A and B. There is also an Annual Election Period, from October 15 to December 7, when people can add or change their coverage, effective January 1 of the following year. There are also Special Enrollment Periods that allow qualified individuals to enroll or disenroll at other times during the year. Once people choose a plan they cannot change until the next Annual Election Period, unless they qualify for a Special Enrollment Period. 3 IS PART D OPTIONAL? Part D enrollment is optional for most people. People with coverage at least as good as Part D (this is called creditable coverage ) should generally stay with their existing plan and not join Part D. Examples of creditable coverage are TriCare, VA, and federal retiree insurance. People who do not have creditable coverage, and who don t join Part D when they are first eligible, may have a waiting period for coverage and may pay a monthly late enrollment penalty, if they join later on. Finally, while enrollment in Part D is voluntary for most people, people with lower incomes, such as people in Medicaid, SSI or a Medicare Savings Program (MSP), may be automatically enrolled in a plan. CREDITABLE COVERAGE AND THE LATE ENROLLMENT PENALTY Insurers must notify their Medicare-eligible members of their plan s creditable coverage status by September 30 of each year. People without creditable coverage who sign up late will have to pay a late enrollment penalty. The penalty is 1% of the national base beneficiary premium, multiplied by the number of full months the person could have been in Part D. In 2016 the penalty is about 34 per month. It changes each year as the national base beneficiary premium changes. People who qualify for the Part D Low Income Subsidy (LIS) are not subject to a late enrollment penalty, even if they are late in enrolling in a plan. 4 THE STANDARD BENEFIT Plans can differ from each other but they cannot offer less than the basic standard benefit approved by Medicare. Under the 2016 standard benefit, people pay a $360 deductible before they get any benefits from the plan. Then they pay 25% of the next $2,950 in drug costs ($737.50), and Medicare pays the other 75%. After that they have a gap in coverage known as the donut hole. While in the donut hole they pay 100% of drug costs until they have spent another $3, out of pocket. (see Donut Hole Discount) They must continue to pay their premiums during this gap in coverage. Once they have spent $4,850 in drug costs ($360 + $ $3,752.50), they become eligible for catastrophic coverage. For the rest of the calendar year they pay just 5% of drug costs, or $2.95 for generic and $7.40 for brand name drugs, whichever is greater. ACTUARIALLY EQUIVALENT AND ENHANCED PLANS Instead of offering the standard benefit, most plans offer coverage that is actuarially equivalent but differently structured. For example, many plans do not have a deductible. And, instead of the flat 25% co-pay, they have a tiered co-pay system. This means they charge different co-pay amounts for different types of drugs, such as generics, brand name drugs and injectable drugs. Some plans also offer enhanced coverage; for example, they may offer coverage of some drugs during the donut hole. 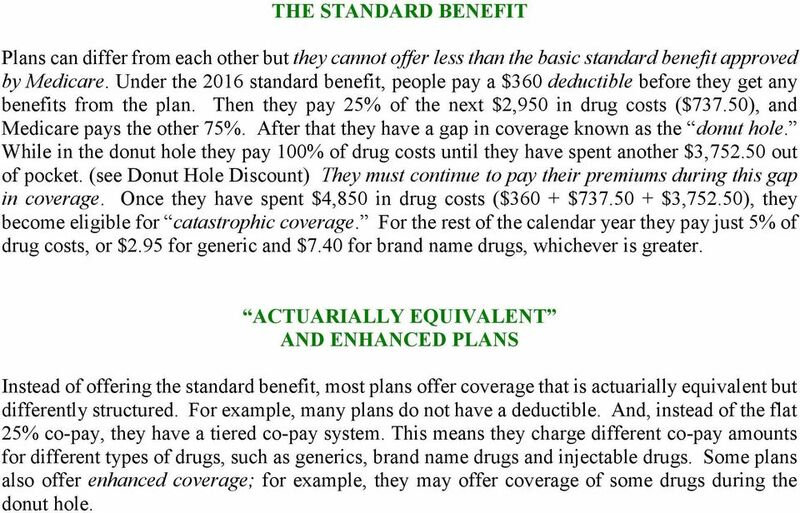 5 DONUT HOLE DISCOUNT In 2016, people who reach the Donut Hole gap in coverage will get a 55% discount on brand name drugs and a 42% discount on generics. They will also pay a small dispensing fee. The discounts will increase every year until 2020, when the Donut Hole is eliminated. 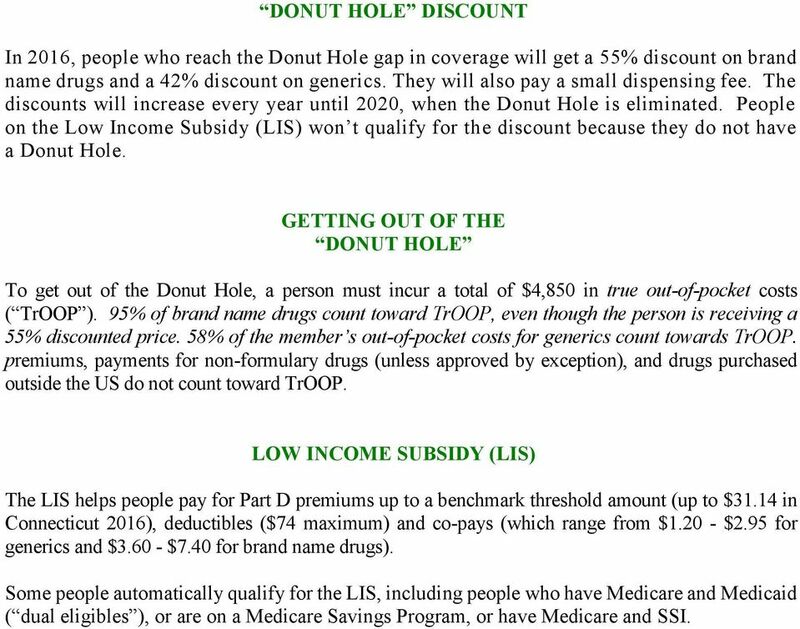 People on the Low Income Subsidy (LIS) won t qualify for the discount because they do not have a Donut Hole. GETTING OUT OF THE DONUT HOLE To get out of the Donut Hole, a person must incur a total of $4,850 in true out-of-pocket costs ( TrOOP ). 95% of brand name drugs count toward TrOOP, even though the person is receiving a 55% discounted price. 58% of the member s out-of-pocket costs for generics count towards TrOOP. premiums, payments for non-formulary drugs (unless approved by exception), and drugs purchased outside the US do not count toward TrOOP. LOW INCOME SUBSIDY (LIS) The LIS helps people pay for Part D premiums up to a benchmark threshold amount (up to $31.14 in Connecticut 2016), deductibles ($74 maximum) and co-pays (which range from $ $2.95 for generics and $ $7.40 for brand name drugs). Some people automatically qualify for the LIS, including people who have Medicare and Medicaid ( dual eligibles ), or are on a Medicare Savings Program, or have Medicare and SSI. 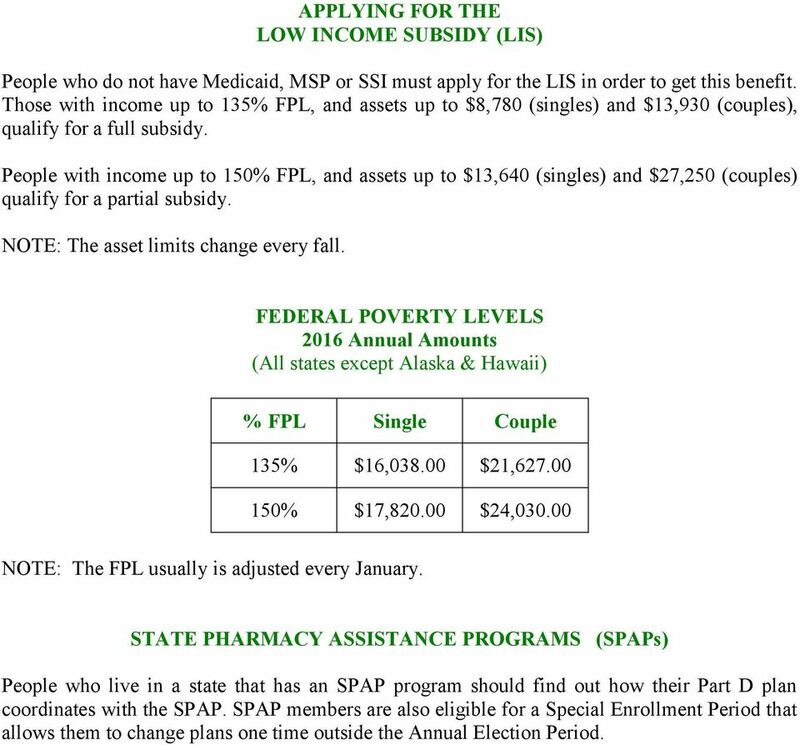 6 APPLYING FOR THE LOW INCOME SUBSIDY (LIS) People who do not have Medicaid, MSP or SSI must apply for the LIS in order to get this benefit. Those with income up to 135% FPL, and assets up to $8,780 (singles) and $13,930 (couples), qualify for a full subsidy. People with income up to 150% FPL, and assets up to $13,640 (singles) and $27,250 (couples) qualify for a partial subsidy. NOTE: The asset limits change every fall. FEDERAL POVERTY LEVELS 2016 Annual Amounts (All states except Alaska & Hawaii) % FPL Single Couple 135% $16, $21, % $17, $24, NOTE: The FPL usually is adjusted every January. STATE PHARMACY ASSISTANCE PROGRAMS (SPAPs) People who live in a state that has an SPAP program should find out how their Part D plan coordinates with the SPAP. SPAP members are also eligible for a Special Enrollment Period that allows them to change plans one time outside the Annual Election Period. 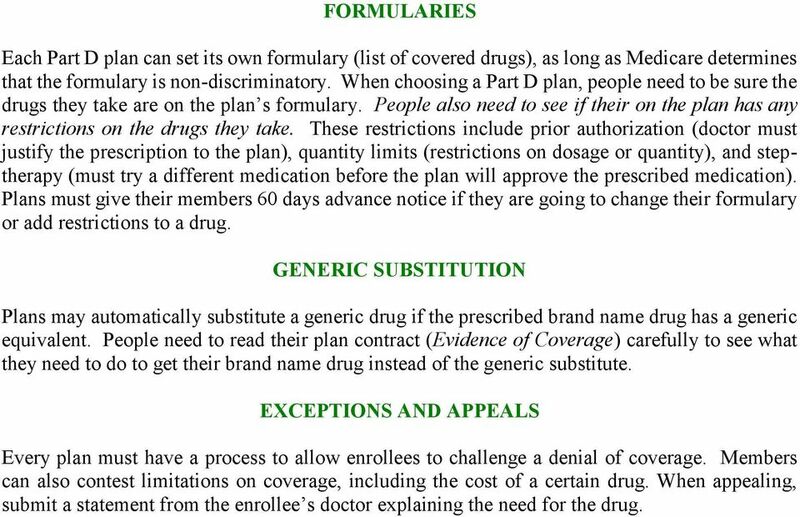 7 FORMULARIES Each Part D plan can set its own formulary (list of covered drugs), as long as Medicare determines that the formulary is non-discriminatory. When choosing a Part D plan, people need to be sure the drugs they take are on the plan s formulary. People also need to see if their on the plan has any restrictions on the drugs they take. These restrictions include prior authorization (doctor must justify the prescription to the plan), quantity limits (restrictions on dosage or quantity), and steptherapy (must try a different medication before the plan will approve the prescribed medication). Plans must give their members 60 days advance notice if they are going to change their formulary or add restrictions to a drug. GENERIC SUBSTITUTION Plans may automatically substitute a generic drug if the prescribed brand name drug has a generic equivalent. People need to read their plan contract (Evidence of Coverage) carefully to see what they need to do to get their brand name drug instead of the generic substitute. EXCEPTIONS AND APPEALS Every plan must have a process to allow enrollees to challenge a denial of coverage. Members can also contest limitations on coverage, including the cost of a certain drug. When appealing, submit a statement from the enrollee s doctor explaining the need for the drug.